I don't often bake in the evening. I mean what's the point of it? It will not be ready untill after 10 o'clock, leaving you with only 2 hours of enjoying your baked good before going to bed (and it's bad enough as it is to eat before going to bed!!). When you bake something in the morning or midday, you can snack from it throughout the entire day, bring it with you to work, or serve it for dessert. Well I did bake these in the evening. I saw them in a blogpost and immediately got up and baked them because the fabulous ingredients. 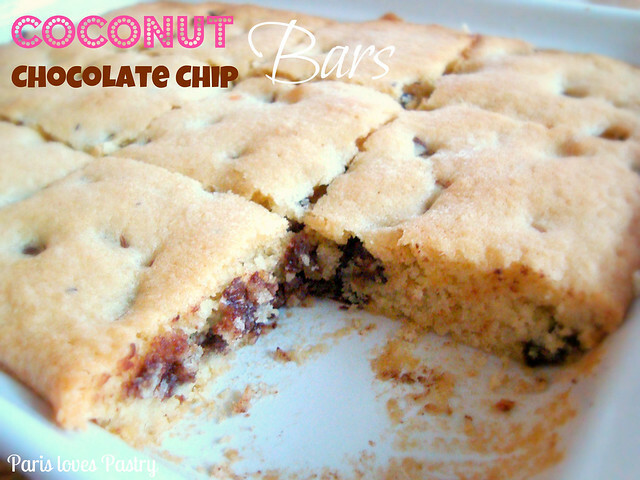 Coconut and chocolate chips. In a bar. What's not to like? These were absolutely SCRUMPTIOUS! So scrumptious that my cat tore off the cellophane wrapper off them TWICE and ate them too. Like his mummy, he has no self-restraint. Rating: 5 out of 5. - Preheat oven to 350F. Butter and flour an 8×8 or 7×10 baking pan. Set aside. - In the bowl of a mixer, cream butter or margarine, peanut butter, and sugar on medium speed until fluffy. Add add eggs and vanilla and beat until mixed in. With the mixer on low, add the combined flour, baking powder and salt, mixing until completely combined. 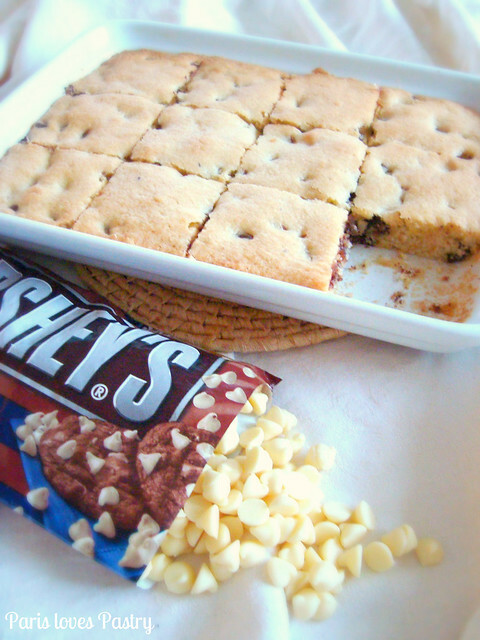 Fold in coconut and chocolate chips. - Spread batter in prepared pan and bake for about 30 minutes or until center is golden brown and edges are a dark brown. Remove from oven and let cool for 5-10 minutes before cutting and rolling in powdered sugar while still warm. Mmmmmmmmm - gotta love chocolate and coconut together, a bit liked a baked Bounty! Looks delicious! I would so love to try some. I am sure it tastes fantastic! Obviously I'm a fan of these, lol. I'll have to try them again without the peanut butter!